This can be made in a flat pan (like a brownie) or in a ring tin. I tried using a silicon pan but it didn't brown well. Prepare metal pan by buttering pan and dusting with flour. Shake out excess flour. Pulse pistachios in a food processor until finely ground. (Do not overprocess and let them become a paste). Add flour, baking powder, cardamom, and salt and pulse once or twice to mix. Combine milk and vanilla in a measuring cup. Beat together butter and sugar until pale and fluffy. 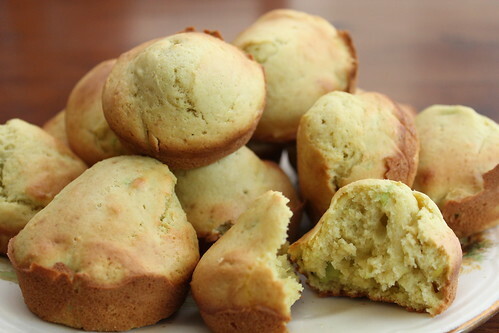 Alternately add pistachio flour and milk in batches, beginning and ending with flour, and mix at low speed until just combined. Spread batter evenly in cake pan and bake in middle of oven until a tester comes out clean, about 20 minutes. Cool in pan on a rack 10 minutes, then run a thin knife around sides of cake and invert onto rack. Remove paper and reinvert cake onto a platter. Cut into squares, dust with icing sugar, and serve warm or at room temperature. This is another old favourite from the Edmonds Cookbook. You may know them as Scotch pancakes, or hotcakes. 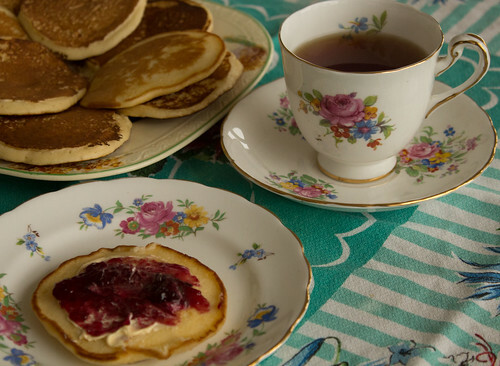 They can be served buttered with jam, as in the photo, or with jam and cream. In a separate bowl, beat the egg and sugar together until thick. Add with milk to sifted ingredients. Cook tablespoonfuls on a hot greased girdle or pan. I grease the surface with butter. Ensure the temperature is not too hot or the edges will burn. Turn pikelets over when bubbles start to burst on top surface. Makes 8-10. Serve warm or cold. I got this recipe from Mama's Gotta Bake. I've changed the quantities so that it serves 2. Servings are cooked in individual ramekins, so the quantity can simply be doubled or tripled to serve more people. Add milk, zest, and juice. Add flour and mix smooth. In another bowl, beat the egg white until stiff peaks form. Fold egg white into lemon mixture. Liberally sprinkle sugar on top. Bake for 30-40 minutes in a waterbath* in a pre-heated 180° oven, or until sugar caramelises and tops are golden brown. Be careful not to let the sugar burn. *I place the filled ramekins into a large roasting pan and add boiling water to come half-way up the ramekins. I found this avocado recipe to use up some of the surplus avocados we have. It makes 12. Sift flour, cornmeal, baking powder, and salt into a bowl. Mix in eggs and milk until you have a smooth batter. I just do all of this by hand. Discard any dark bits on the avocado and mash with a fork. Add avocado to the batter, mixing until just smooth. Spoon batter into a greased muffin pan. Bake 180°C for 15 minutes, until cooked through and the tops are golden. Cool for a few minutes in the tray before turning out onto a wire rack.